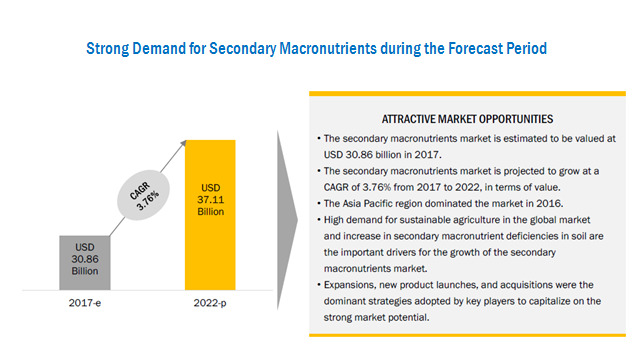 [186 Pages Report] The secondary macronutrients market was valued at USD 29.85 Billion in 2016 and is projected to reach 37.12 Billion by 2022, at a CAGR of 3.76% during the forecast period. The key players have been identified through secondary sources such as the US Department of Agriculture (USDA), the Food and Agriculture Organization (FAO), the International Fertilizer Association (IFA), The Fertilizer Institute, The Sulphur Institute (TSI), and the International Fertilizer Development Center (IFDC), while their market share in respective regions has been determined through both, primary and secondary research. 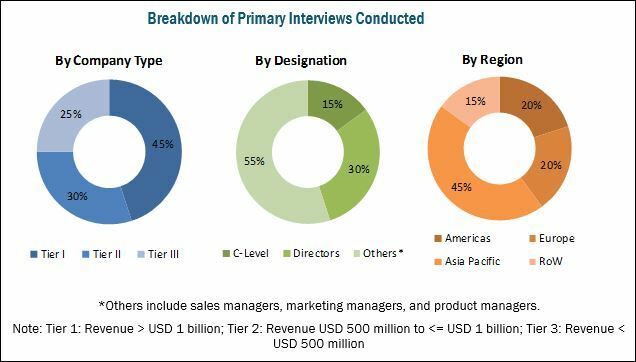 The research methodology includes the study of annual and financial reports of top market players, as well as interviews with industry experts (such as CEOs, VPs, directors, and marketing executives) for key insights (both quantitative and qualitative) for the secondary macronutrients market. The various contributors involved in the value chain of the secondary macronutrients market include raw material suppliers, R&D institutes, secondary macronutrient manufacturing companies as Nutrien (Canada), Yara International (Norway), The Mosaic Company (US), Israel Chemicals Ltd. (Israel), and K+S (Germany), and government bodies & regulatory associations such as the US Department of Agriculture (USDA) and the US Environmental Protection Agency (EPA). This research report categorizes the secondary macronutrients market based on nutrient, formulation, application method, crop type, and region. The secondary macronutrients market is estimated to reach a value of USD 30.86 Billion in 2017 and is projected to reach USD 37.12 Billion by 2022, at a CAGR of 3.76% from 2017. The market is driven by the need for increasing the yields of crops and the growing demand for high-value crops. The secondary macronutrients market, based on nutrient, has been segmented into sulfur, magnesium, and calcium. Calcium occupied the largest share in the market as it is consumed in large amounts during the growing stage of the crop. Also, it is the most important nutrient that is required by crops and helps to strengthen cell walls and reduce bruising and disease in fruit & vegetable crops. 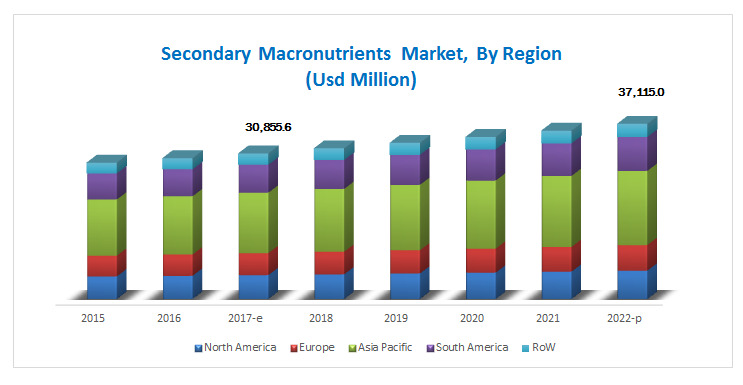 The secondary macronutrients market, by formulation, has been segmented into liquid and dry. Due to the extended shelf life of granular fertilizers, it helps to provide nutrition to plants over an extended period; it is also cost-effective when compared to liquid fertilizers; hence, the dry formulation segment is estimated to dominate the market in 2017. The secondary macronutrients market, by application method, has been segmented into solid application and liquid application. Liquid application occupied the largest share due to the high adoption of fertigation and foliar applications. Under liquid application, fertigation is the most-widely adopted application method, followed by foliar application. Farmers mainly prefer liquid application due to its efficacy and savings on labor costs. The secondary macronutrients market, by crop type, has been segmented into cereals & grains, oilseeds & pulses, fruits & vegetables and others (turf, forages, ornamental crops, stimulant crops, and sugar crops). The fruits & vegetables segment is estimated to dominate the market in 2017, due to the increased demand for high-quality fruits & vegetables. Limited product availability and increasing prevalence of counterfeit products have been important restraining factors for the market growth. The global market for secondary macronutrients is dominated by large-scale players such as Nutrien (Canada), Yara International (Norway), The Mosaic Company (US), Israel Chemicals Ltd. (Israel), and K+S (Germany). Nufarm (Australia), Koch Industries (US), Coromandel International (Italy), Deepak Fertilisers and Petrochemicals (India), Haifa Chemicals (Israel), Sapec Agro Business (Portugal), and Kugler Company (US) are a few other key market players that also have a significant share in the secondary macronutrients market.